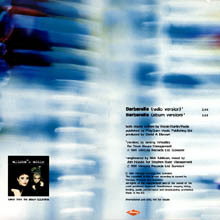 One track promo in slimline jewel case with picture sleeve. Subtle difference between the promo and the commercial single - on the commercial release the image is zoomed in and cropped slightly. 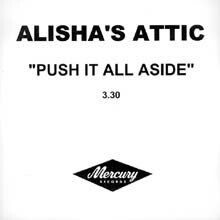 From the inside sleeve: Two sisters - Karen and Shellie - are Alisha's Attic. 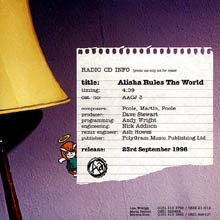 "I Am I Feel" is their debut 45 taken from the forthcoming long player "Alisha Rules The World". 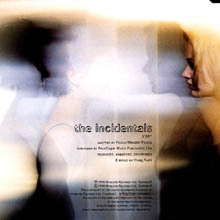 One track promo in slimline jewel case. 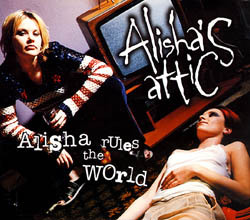 Used to promote the US release of the "Alisha Rules The World" album, the single was never released in the US. Slight difference in the cover from the UK version, and different inner cover graphic. One track promo in slimline jewel case. 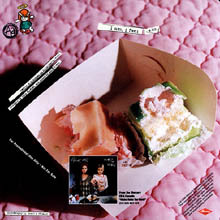 Subtle difference between the promo and the commercial single - on the commercial release the title text has a fuzzed out background. Curious jump in the catalogue number sequence: goes from AACJ.1 to AACJ.3. This means that all future promo catalogue numbers will be out of sync with the commercial releases for the ARTW singles. One track promo in card sleeve. 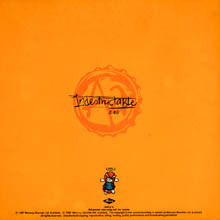 Note the difference in the spelling from the commercial release - the single was re-titled "Indestructible" when it came out. (Somebody at Mercury found a dictionary!). 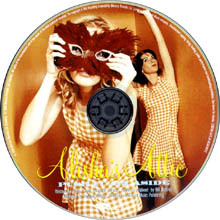 This is the only promo from the ARTW singles to have a completely different sleeve from the commercial release. One track promo in slimline jewel case. The only difference in the sleeve to the commercial release is the lack of the white triangle in the top left corner designating CD1 and CD2. One track promo in slimline jewel case. The subtle difference in the sleeve, the commercial release is has a metallic sheen and the promo does not. Note the renumbering of the cat. no, this puts the promo and commercial single numbers back in sync. One track promo in slimline jewel case. Virtually no difference in the sleeve from the commercial release apart from the absence of the "CD1" and CD2" designations. 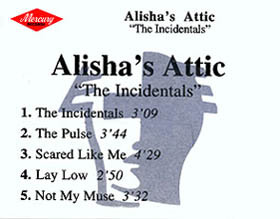 Two track promo in slimline jewel case. Virtually no difference in the sleeve from the commercial release apart from the absence of the "CD1" and CD2" designations. One track promo in slimline jewel case. Differences from the commercial release: the disc is a great looking picture disc (the actual release featured plain coloured discs) and the sleeve is much paler. One track promo in slimline jewel case. Has a great full colour picture disc not available on the commercial release. Exactly the same sleeve though for once - no subtle differences. 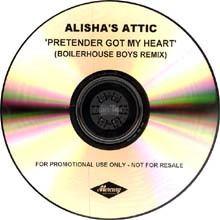 One track promo CD-R (sometimes called acetate) in album style jewel box. 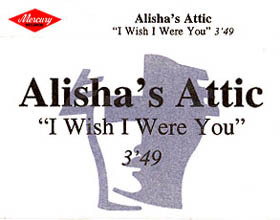 Around this time, CD-R promos started to take over from promo cassettes, although there is a concurrent promo cassette for Wish I Were You. Promo cassettes no longer exist, they have been superseded by CD-Rs. 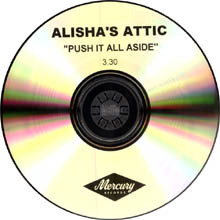 One track promo CD-R in card sleeve. CD-R promos never have catalogue numbers (and neither did the forerunner, the promo cassette). 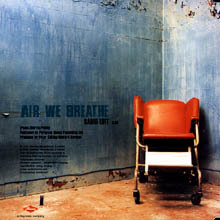 One track promo CD-R in card sleeve. 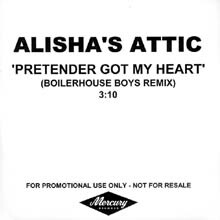 Much faster tempo on the remix - not sure that it does this great ballad justice! 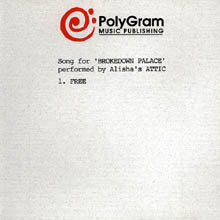 This promo CD-R was first discovered in 1999, but it did not make the final cut of the "Brokedown Palace" official soundtrack (shown left). 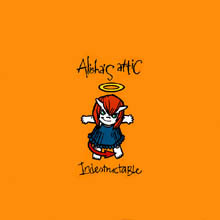 For several years this was an extreme rarity, as it was the only known source of this song. 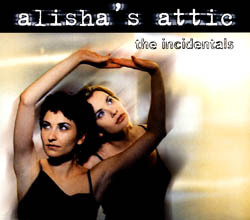 However, the 2001 release of the girls' self produced "Attic Vaults 1" album included this track, so it has now been officially released. It's a mystery why this song didn't make the album, because it's stunning, one of their best tracks in my opinion. 5 track promo cassette. 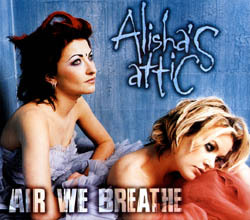 Interestingly, "Scared Like Me" was dropped from the lineup before the actual release and was replaced by "Valentines '98" on the CD. I wonder what prompted that decision, because "Scared Like Me" is a much better track (and eventually it turned up on the Japanese "Illumina"). One track cassette promo. 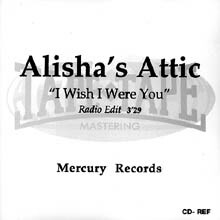 Titled "I I Wish I Were You" like the CD-R promo, the "I" in the title got lost when the the single actually came out! 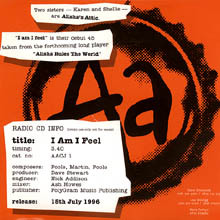 This is the only known release to have both a CD-R promo and a cassette promo.